Japan has formally unveiled its record $150bn (£105bn) stimulus package as it seeks to revive its flagging economy. 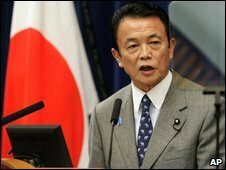 Prime Minister Taro Aso said the plan - worth about 3% of its gross domestic product - aimed to protect livelihoods and to foster future growth. The 15.4 trillion yen package includes measures to boost fuel-efficient vehicles and consumer electronics. Japan's economy has been battered by a collapse in exports and is facing its deepest recession since World War II. Japan's ruling coalition plans to put the stimulus package before parliament by the end of the month. "We are implementing a resolute policy in the form of economic crisis measures in order to protect the livelihoods of the people," Mr Aso told a news conference. "The first of our objectives is to prevent the economy from falling through the floor. Another objective is to give a sense of security to the people," he said. This is the government's third stimulus plan in the past year. It comes on top of 12tn yen of spending in earlier packages, as well as tax breaks and cash handouts. It also creates a financial safety net for temporary workers, boost struggling firms and support regional economies. Mr Aso said the new steps would be partially funded by issuing new government bonds. Japan has been worst-hit among advanced nations by the global economic downturn. Its exports have halved amid an unprecedented collapse in worldwide demand for the cars and electronic gadgets the country produces. The government has a long-term goal to shift the economy's focus from exports to domestic sectors poised for major growth. It wants to be a world leader in energy efficient technology and to bolster care for its huge and growing elderly population. The aim is to create as many as two million jobs in the next three years. On Thursday, shares in Tokyo gained as details of the stimulus plan emerged. Japan's benchmark Nikkei 225 index closed at a three-month high, rising 3.74% to finish at 8,916.06. Shares in carmakers and solar power-related firms gained. "This may contribute to GDP for a year," said Masamichi Adachi, an economist at JP Morgan. "The consequences over the longer term are negative as we are piling up more of a fiscal burden. Bond issuance will go up from here on." The package came out as figures showed Japan's machinery orders unexpectedly rose in February thanks to gains in the services sector.